As per the latest updates from the officials, there may be more people under the collapsed buildings. Maintenance work and rescue operations are currently going on. In awe of strong tremors and futher shocks, thousands of people left their houses and spent the night in open in the town of Mashiki, near Kumamoto city on the island of Kyushu. Further reports have suggested that aftershocks are causing problems and proving to be hurdles in the rescue operations. 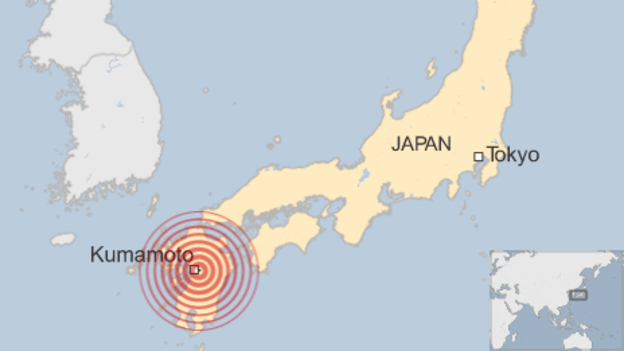 As of now, there is no tsunami warning after the magnitude 6.4 quake struck at 12:26 GMT east of Kumamoto. Nuclear reactors are fine on the island. Two Sendai reactors were reported to be working fine as normal while the three Genkai nuclear reactors were already closed for the inspection routine checkup. The earthquake struck Japan at a depth of 10 km and then, there were aftershocks which measured about 5.7 on the richter scale and were felt after 40 minutes. Thereafter, another aftershock of 6.4 was felt after midnight local time. On the contrary, the reports of the seismology department of Japan are different. It has concluded different epicenter. Its reports suggest that shaking at some places took place as high as magnitude as of the quake that hit the nation in 2011. That time, it resulted into Tsuanmi. More than 18000 people were killed in that incident. Moreover, it caused the meltdown at the Pukushima Diichi nuclear plant. A police officer said that the shaking was so strong that he couldn’t stand still. Initially only two were reported dead, but later on, when the rescue team arrived, the toll rose to nine when the team worked through night. Yasuhiro Soshino from the Japanese Red Cross Kumamoto Hospital said that they had received 254 injured people. 15 were severe cases out of those people. Yoshihide Suga, the Chief of Cabinet Secretary told us that more than 19 house collapsed and the government is still assessing the extent of the amount of of the damage. Electricity and gas supply has been affected to more than 16,000 and 38,000 houses respectively. Mashiki, 15km east of Kumamoto, witnessed two deaths. It has experienced the most severe shaking. One died while being pulled out of the waste construction material while another got killed in a fire as told by the Kumamoto prefecture disaster management officer Takayuki Matsushita. In Mashiki, residents told The Reporter Times that houses and walls collapsed like dirt and the water supply has been cut off since then. An official in Uki revealed that houses collapsed there also including the city hall’s ceiling. All the people were at their respective homes when this incident happened. Some trains services are suspended as a precautionary measure. Japan regularly witnesses quakes but the strict building codes and guidelines restrict the damage. Stay tuned to TRT to receive latest Earthquake in Japan news and updates.